Ever since the fall of 1914,Zeppelins had been used by the German Navy for reconnaissance over the strategic North Sea, and had participated in both Dogger Bank and Jutland, the major naval actions of the war in that region. Throughout this period, the Royal Naval Air Service made a number of attempts on the Zeppelin bases, mounting the first long-range bombing mission in history with Avro 504s against the Zeppelin works itself in 1915. The RNAS was forced to operate at maximum range and limited numbers, so that real success always eluded them. In 1917, fighter aircraft first went to sea when Sopwith Pups and Camels were flown off barges towed at high speed behind destroyers, to provide interception capability when Zeppelins were spotted; several of the aerial giants were destroyed this way in 1917-18. Everything changed in 1918 with the modifications to the navy's first aircraft carrier, HMS "Furious", providing for a complete flight deck - rather than the previous landing-on and taking-off decks - and an elevator which allowed the fragile aircraft to be stowed below in the hangar deck. Now suitable aircraft could be taken to sea and take off armed with a worthwhile load. The target was to be the Zeppelin sheds at Tønder, which was the major thorn in the Royal Navy's side. Tønder, the biggest naval Zeppelin base, comprised three hangars. The largest, "TOSKA," was 730ft long, 220 ft. high and 130 ft wide; it could house two of the biggest Zeppelins. Operation F7, the successful raid on July 19, 1918, was actually the third to have been attempted. Operation F5 in early June was abandoned after "Furious" had left port, due to the possibility of having been spotted by U-boats. The strike would have to enter coastal waters to give the aircraft sufficient range, and would be highly vulnerable to interception by the High Seas Fleet if sufficient notice were given. Operation F6 in late June was abandoned due to bad weather. Operation F7 left Rosyth dockyard in Scotland on July 17, 1918. "Furious" was escorted by five cruisers: HMS "Caledon," "Galatea," "Royalist," "Phaeton" and "Inconstant." A squadron of battleships from the Grand Fleet operated in support: HMS "Revenge," "Royal Sovereign," "Ramillies," "Royal Oak" and "Resolution" with four cruisers and other destroyers in case the High Seas Fleet put in an appearance. Aboard "Furious" were seven Sopwith 2F.1 Camels. Capt. Jackson, Capt. Dickson and Lt. Williams were the first strike, followed by a second strike by Capt Smart, Capt. Thynne, Lt. Dawson and Lt. Yeulett. This was a maximum-performance operation. The Camels would be operating at maximum range, with each aircraft carrying four 50-lb bombs. There was not enough fuel for the planes to join up in formation once launched from the carrier. The plan was that they would return to the fleet, to ditch near a destroyer for pickup. Alternatively, if they could not reach the fleet or the fleet was forced to retire, they were to land in neutral Denmark. First light came at 0300, July 19, 1918, with "Furious" 90 miles off the North German coast. The first strike climbed to 5,000 ft, heading south down the coast of Denmark until turning east and climbing to 6000 ft to approach Tønder. Dickson attacked what he thought was the main shed while the other two aircraft actually attacked "TOSKA." Dickson dropped his first bomb from 700ft, hitting what he thought was the target, though it was later determined he actually bombed the nearby town. Jackson and Williams set Zeppelins L-54 and L-60 afire in the hangar; flames and smoke rose to over 1000ft. Dickson was the only one to make it back to the fleet, locating the inshore destroyer off Lyndvig Lighthouse at 0545; he ditched nearby and was picked up by HMS "Violent." Jackson arrived at the prearranged rendezvous at 0455 but had engine trouble; he managed to restart and climb, but became lost above the clouds. He ran out of fuel and crashed in Denmark, where he burned the airplane and then was taken to the local English Consul by a farmer. Williams force landed near Esjberg, but was unable to destroy his aircraft due to the arrival of the local police. The second strike departed "Furious" at 0322, but only three reached Tønder. Capt. Thynne suffered engine trouble and was forced to return to the fleet; he was successfully picked up, though the rescuing destroyer ran over his aircraft and destroyed it. The last three arrived over the target at 0445, when they were subject to some anti-aircraft fire. They struck TONI and TOBIAS, releasing their bombs from 800 ft, though they were not able to observe the results. Capt. Smart successfully rejoined the fleet by 0630. Lt. Dawson was also forced to land in Denmark, where he joined Jackson and Williams in Esjberg. Lt. Yeulett, having departed on his own, was never seen again. His body washed up on a beach in Ringkøbing Fjord on July 30; it is presumed he ran out of fuel, was forced to ditch in the fjord and drowned. He was buried in Havrvig Churchyard. After some considerable adventures which involved an escape from internment camp in Aarhus, a clandestine trip to Copenhagen, and a voyage across the Skaggerak during which they were nearly intercepted by a German trawler, Dawson, Jackson and Williams got to Sweden and were taken to Norway, where they took a steamer to England, arriving back at Rosyth on August 25, 1918 to rejoin "Furious." Lt. Yeulett received a posthumous Distinguished Flying Cross. Dickson received a second DSO, while Dawson, Jackson, Thynne and Williams also received DFCs. The attack on the Tønder Zeppelin base - the first carrier air strike in history - effectively ended use of the base by the Germans for the remainder of the war, a considerable strategic victory for the Royal Navy. When one considers how difficult it still is today to bring an airplane aboard an aircraft carrier, it is amazing to think that the first successful naval strike fighter in history was the trickiest, most difficult to fly, in the RAF's inventory: the Sopwith Camel, said to have killed almost as many of its own pilots in training as it did the enemy's in combat. 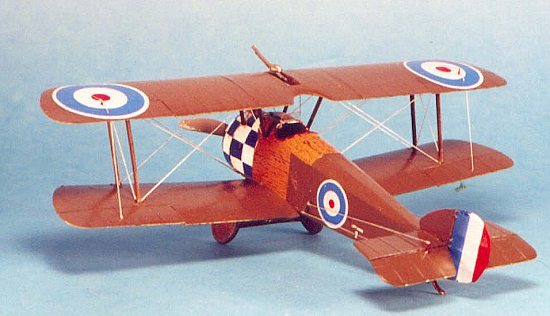 The Sopwith 2F.1 Camel differed from its land-based cousin with a different upper wing that had a larger center section which increased span, longer-span lower wings, and a detachable rear fuselage. This latter provided one of the two major visual differences between the versions, since the elevator controls used exterior horns on the fuselage behind the cockpit, with detachable connections inside. The other major recognition factor was that the fuselage mounted only one Vickers machine gun, with an upward-firing Lewis gun mounted in the open central section - this was in recognition that the main prey of the 2F.1 Camel was the Zeppelin, which could often be found flying above the Camel's operational ceiling. 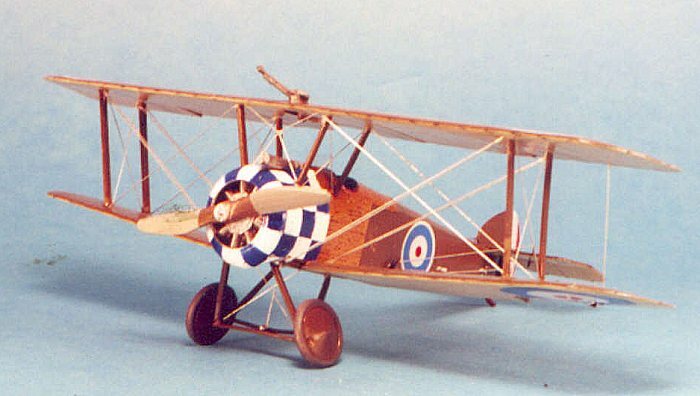 The Blue Max kit of the Camel provides parts to allow a modeler to make either the land-based F.1 Camel or the naval 2F.1 aircraft. These include a different fuselage, different upper fuselage decking, different upper wing center section, and the longer lower wings. Having built two of the land-based Camels and practicing my policy of never ever throwing away parts, I was the possessor of two fuselages for the 2F.1, four lower wings, and a white metal cowling (since I had used a plastic cowling for my Billy Barker Camel, which had large cooling vents in the cowling). This was almost enough to make another model, but not quite, since I needed tail feathers, landing gear, an engine and a cockpit. I then obtained a Monogram Camel, which is developed from the older Aurora Camel. With some work, I would have the necessary parts to make a 2F.1 camel from the collection of spare parts. The first thing was to modify two of the lower wings, cutting them so they were the same length as the standard upper wing outer panels, and attaching them to the center section. This was easily done. I scratchbuilt a cockpit interior, using Evergreen strip for the internal structure, a seat from a Profipack Hanriot (for which I had used the photo-etch seat) sanded down and reshaped, an instrument panel from sheet plastic, and a gas tank made from the same source. With a little bit of extra detail in the form of some Eduard photo-etch I hadn't used on another model, the Monogram engine was tricked out, then painted. It fit within the Blue Max cowling easily. The rudder and elevator from the Monogram kit were too thick, and also suffered from the usual "hills and valleys" with which other manufacturers than Blue Max portray fabric-covered wings and tails. I sanded these down to proper thinness, and created the rib tape detail trimming strips from the extra masking left over from an Eduard Express Mask, which went on easily and looked just right. The model was ready to be painted. Bob Pearson's World War I profiles include two 2F.1 Camels from H.M.S. "Furious" in 1918, one of which can be easily done if one keeps the Blue Max decals (I didn't). The other, flown by second strike leader Captain Bernard Arthur Smart in the Tønder raid, is by far the better looking. It also requires more work since the cowling and forward fuselage is covered with a blue and white checkerboard. The first thing to do was paint the cowling and forward fuselage flat white. When this was dry, I cut out several masking squares from drafting tape and applied them. Once on, they required additional trimming with an Xacto knife to make them look right over all the curves of the airplane. I then used Tamiya Flat Blue for the rest of the checkerboard. When the blue was dry, I removed the masks, did a bit of cleanup from overspray and leakage with a paintbrush and white paint, then masked off the nose. I did some pre-shading with flat black, then painted the lower surfaces with Gunze-Sanyo "Sail Color" for the Clear Doped Linen, and the upper surfaces with my P.C.10 mixture made from Khaki, Red Brown, and Dark Earth - it comes out differently each time I make up a new bottle-full, but P.C.10 itself constituted a wide range of color, so one is on safe ground here. Once all was dry, I gave the model three light coats of Future. I had already used the very good Blue Max decals on my other Camel models, and the Monogram decals were suffering from age. Not to worry! SMER, which releases otherwise-unmodified old Aurora and Merit kits, has taken to providing their newer releases with very good Propagteam decals. The kits are cheap enough one can buy them for the decals and not feel they have thrown money around. These decals went on easily and looked good. Once the decals had set I washed the model, shot a coat of Future to seal it, then a coat of "Flat Future" to bring down the sheen to what it should be for a 1/48 model. I had scratchbuilt the landing gear from the Contrail strut material, and quickly assembled the landing gear to the model. 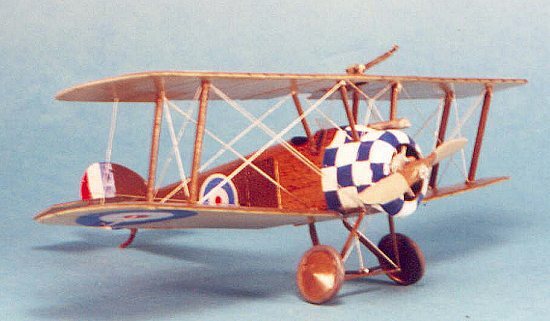 I used the Monogram wheels, and set them at an angle, the way the wheels of Sopwith fighters sit since the axles were held with bungee cords for the "oleo" action. The interplane and cabane struts went on, the white metal rear control horns were in place, and the top wing was on. The Camel has a more difficult rigging pattern than other airplanes, but rigging was accomplished in a few hours using High-E guitar string. In actuality, Capt. Smart's airplane likely did not carry the Lewis gun at the time of the attack, since the weight would be needed for a bombload. I have kept the bombs from the Monogram kit, and once I find some information about the bomb racks for the Camel, I will likely remove the Lewis gun and replace it with the four bombs. The Blue Max Camel makes up into a good-looking and accurate kit for any modeler with a modicum of ability and patience. The 2F.1 Camel is an interesting addition to my collection, a truly historic airplane - the first naval strike fighter.